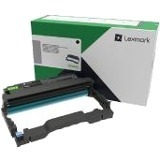 Compact, connected, and affordable, the high-performance Lexmark B2236dw features monochrome output up to 36 pages per minute, standard Wi-Fi connectivity and two-sided printing. When space is at a premium, the B2236dw is easy to find a place for, with dimensions of only 14 inches wide, 13.1 inches deep, and 8.5 inches tall [35.5 cm wide x 33.3 cm deep x 21.5 cm tall]. Standard two-sided printing and energy-saving modes reduce operational costs. In addition to Ethernet and USB connectivity, standard on-board Wi-Fi makes it easy for both desktop computers and authorized mobile users to get output via the Lexmark Mobile Print app, Mopria® certification and AirPrint certification. With printing at up to 36* pages per minute, 1-GHz dual-core processor and 256 MB of memory, the B2236dw offers impressive performance. With up to 251 sheets of input, up to 6000 pages** of available toner capacity, and recommended monthly page volume of 250 to 2500 pages, the B2236dw supports steady, reliable output for up to four users. Essential to Lexmark print system performance, Unison™ Toner's unique formulation consistently delivers outstanding image quality, ensures long-life print system reliability and promotes superior sustainability. Lexmark's comprehensive approach to product security is a design and engineering mandate across our entire product portfolio. Our security features help keep your information safe-in the document, on the device, over the network and at all points in between.